ALERT: This Thursday night at 7:30 p.m. in Morphy Recital Hall, guest artists the Quey Percussion Duo – Gene Koshinsky and Tim Broscious – will perform an eclectic combination of original and existing repertoire for percussion duo. Sorry, no word about specific works on the program. Here is a special posting, a review written by frequent guest critic and writer for this blog, John W. Barker, who also took the performance photos. Barker (below) is an emeritus professor of Medieval history at the University of Wisconsin-Madison. He also is a well-known classical music critic who writes for Isthmus and the American Record Guide, and who for 12 years hosted an early music show every other Sunday morning on WORT FM 89.9 FM. He serves on the Board of Advisors for the Madison Early Music Festival and frequently gives pre-concert lectures in Madison. Once again, Farley’s House of Pianos has shown what a unique outpost it is for classical music in Madison. 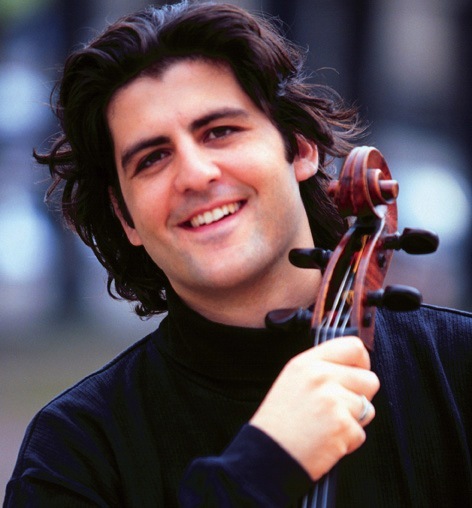 On last Saturday night, it presented the brilliant young Israeli-American cellist Amit Peled (below), with his working accompanist, Noreen Cassidy-Polera, having snared them along the line of their current national tour. Peled will be recalled from his performance of the Schumann Cello Concerto with the Wisconsin Chamber Orchestra in March of 2015. For this visit, he brought with him not only his own talents, but a remarkable instrument. 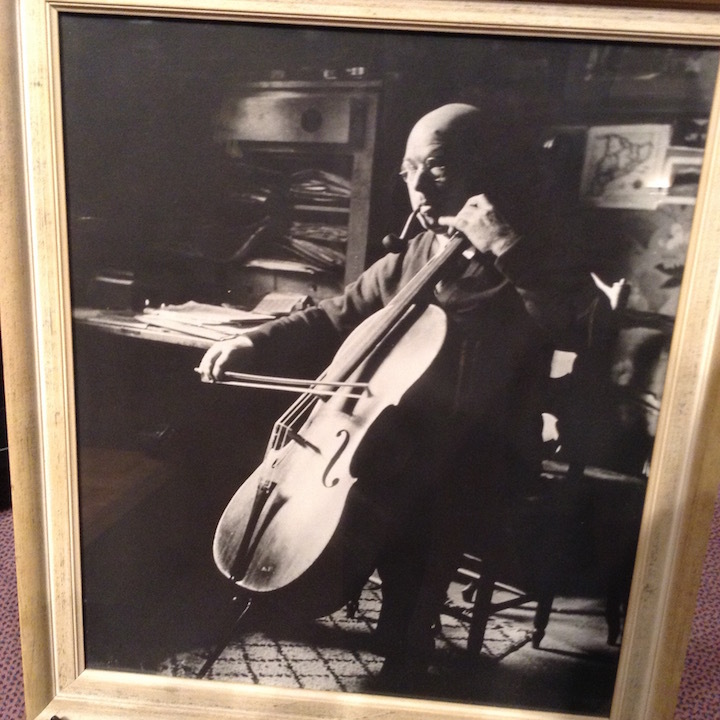 This was a cello made in 1733 by Matteo Gofriller, once owned and played on by no less than Pablo Casals (below). Two years ago, it was entrusted to Peled on loan by Marta Casals Istomin, the great cellist’s widow. For the recital at Farley’s, Peled played a program that Casals had presented himself back in 1915. Thus, listeners heard a century-old program, played on an almost 300-year old instrument, accompanied on a hundred-year-old (1914) Mason and Hamlin piano restored by the Farley workshop. 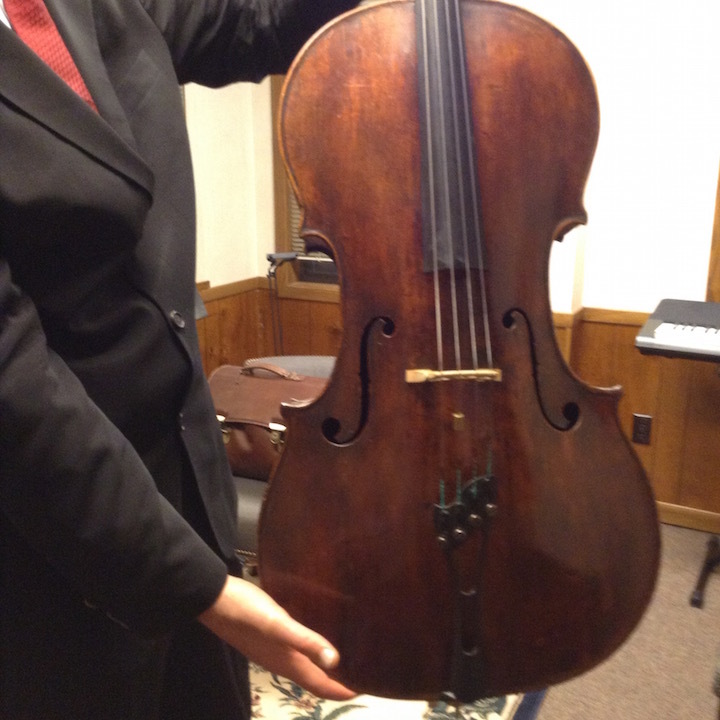 Before the program began, the history of this cello and its maker was discussed by Dan Hendricks (below), a local maker and repairer of string instruments. The cello (below) is a handsome playing-piece of burnished color. It underwent serious restoration after a long period without being played. It has an extraordinarily rich sound through its entire range—a fact that Peled has been learning to exploit, on his own terms. In effect, he played on it as if making love to it, bringing out sound ranging from almost thunderously bold to exquisitely delicate. That range of playing technique was, indeed, the image of Peled’s own remarkable artistry. And the 1915 program was his revival of what used to be typical of a concert menu, in the form of a veritable dinner. All this music was presented with sensitivity, power and endlessly moving nuance by Peled (below). 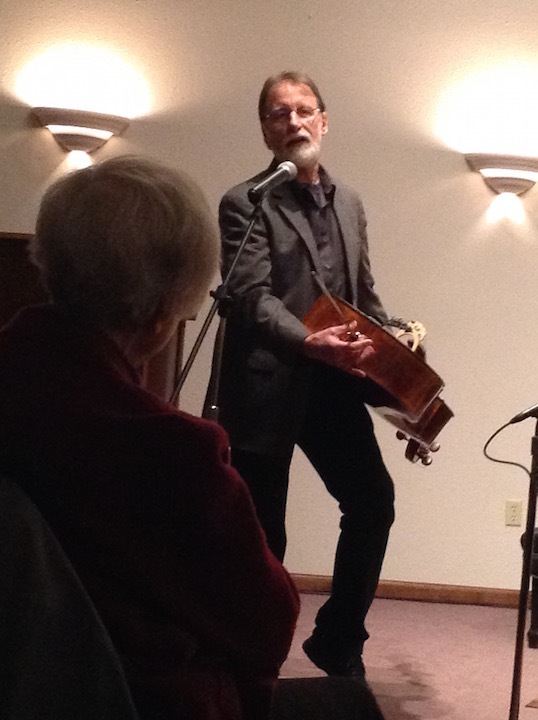 As if his musical artistry were not enough, however, he talked about the “dessert” pieces with the audience, showing fine historical perspective, wittily presented. He even took questions from the house. Beyond that, he and Cassidy-Polera stayed on after the concert to talk at length with any audience member interested—following, as he pointed out, a practice of Casals himself in his appearances. It was, in all, a remarkable musical evening, teaching us much about fine old instruments, delighting us with wide-ranging selections, and revealing a superb musical artist who is also a warm and wonderful human being. 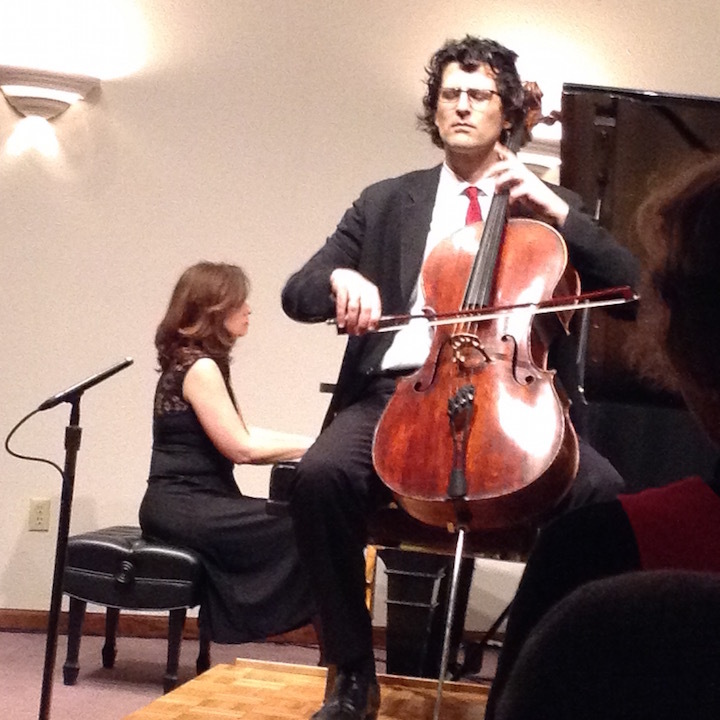 An insult is also what this cellist is doing to the memory of Pablo Casals. Unless he shaved his head and wore funky and very old metal spectacles, I’d want my money back. Seriously, this is a gimmick and a critic like Barker has fallen for it! Amazing. Lots of programs have hooks or gimmicks to attract the attention and the attendance of the public. The Ear thinks of this program as being similar to a rephotographing project, in which a modern photographer tries to duplicate the same photograph of a particular place from a century ago. Or the way Gus van Sant reshot Alfred Hitchcock’s “Psycho” frame for frame, but with different actors and in color. The differences that emerge between the old and the new versions can be telling, even revelatory. This particular re-creation shows how concert programs have changed over the years and gotten more serious. If it is not for you, well then it is not for you. But there is really no need to be so dismissive and insulting about the project. You often make good remarks and insightful criticisms. But what is really amazing is the superficiality, the mocking outrage, of this one. Sorry, this is ALL gimmick. If he’s a good cellist, he doesn’t have to pretend to be Pablo Casals. I find that insulting. And anyone can find the same pieces Casals played long ago on Youtube (often with Casals playing himself). And your analogies are way, way off. Photographers shooting the same scene a century later are adding their own skills and the skills of new photography technology; plus, very likely the scenery has changed. And Gus van Sant could scarcely outdo the shower scene in Psycho, could he, so he copied it? And how did his Psycho do at the box office, by the way? (Clue: it lost money). Being a copycat shows zero originality in my book. Have you ever actually heard Peled? He is a superb cellist, an artist in his own right and on his own terms. That he chose to pay tribute to Casals in this manner – a tribute you seem determined to interpret as insulting or parodistic, although the late Mr. Casals’ widow does not – does not diminish his own artistry. If you don’t like the program, don’t go (as it seems you did not – not that this fact has stopped you from tearing Mr. Peled and Prof. Barker to pieces for a performance you managed to despise anyway, despite your absence). But those who did seem to have enjoyed themselves, as I have every time I have heard Mr. Peled’s fine playing. Perhaps next time you have a flash of insight about how terrible a concert you didn’t attend must have been, you might keep it to yourself?